The Village of Lambley near haltwhistle in Northumberland is situated in a beautiful, tranquil valley with the South Tyne flowing between wooded hills and crossed by the grey stones of Lambley Viaduct. Originally the home of Benedictine nuns from 1132 AD, the Country Estate of Lambley is steeped in border history and set deep in the heart of Roman Wall Country. The remnents of the medieval priory can be found in the gardens and the courtyard of the farm as well as re-used in the construction of the riverside cottages. 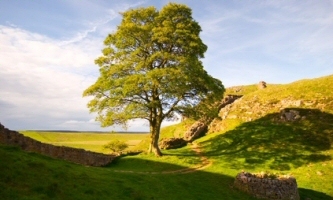 Our location in the heart Hadrian's Wall country with its many Roman fortresses and Norman castles make Lambley an excellent base from which to explore the Northumberland countryside, which, mile for mile, has more castles than anywhere else in the world. En-route for the Pennine Way and the South Tyne Trail, the area offers outstanding and unspoiled walking opportunities over fields of wild flora and fauna. Throughout the year, beautiful woodland areas, carpets of bluebells, fields of wild garlic and rare flowers present themselves for all to admire. Whether you choose to travel on foot, by mountain bike or on horseback, you can explore the forests and countryside at a pace that suits you.